Portraiture rarely turns out well in horror stories—just ask the model in Poe’s “Oval Portrait.” Religious experiences generally turn out badly as well. Little Siobhan Callahan has the misfortune of combining both. Her infamous disappearance inspires an American artist to take a pilgrimage to the scene of the “dark miracle” in Michael Tully’s Don’t Leave Home (trailer here), which opens this Friday in Brooklyn. 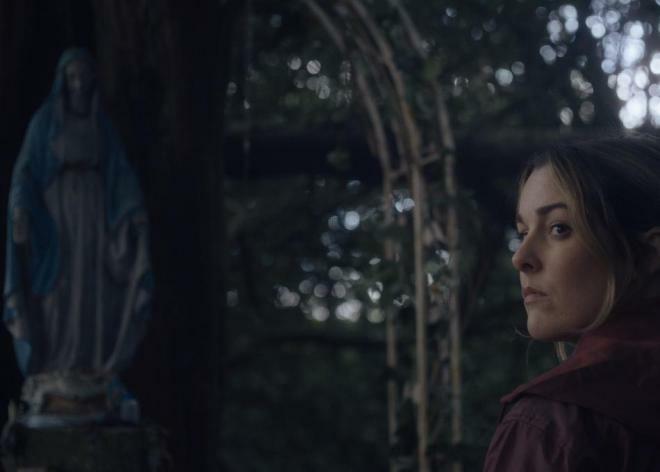 The title sounds like a gimmicky riff on American Express, but it is actually a moody, existential Irish horror movie, very much in the tradition of The Devil’s Doorway. In fact, the films share two principle cast members. As is usually the case with tales of mysterious evil forces, it began years ago. The Callahan family worked for the parish priest, Father Alastair Burke, a skilled amateur painter. One day, Burke painted Siobhan as she stood at an early Christian altar in the forest, where she seemed to become bathed in light. The she disappeared, both from the canvass and real life. Years later, Melanie Thomas is trying to depict the incident in her work. She is a diorama artist, not unlike Toni Colette in Hereditary, but fortunately she doesn’t have a family of her own. After a getting an unfair critical drubbing, Thomas receives a call from Father Burke’s caretaker, Shelly. He read about her show and wants to see and most likely buy the Callahan piece for himself, so off she goes to Ireland. It turns out Burke is nice old gent, who clearly remains haunted by events from his past. On the other hand, Shelly seems to mass produce bad vibes. Their taciturn handyman-manservant Padraig is not particularly welcoming either. Thomas’s experiences on their secluded estate are all kinds of Gothic, channeling all the usual suspects, from Du Maurier to The Innocents to Hammer Films, but Tully has something rather fresh and original up his sleeve. He also has two terrific trump cards in Lalor Roddy and Helena Bereen (also recently seen together in The Devil’s Doorway), who are both terrific as Father Burke and Shelly. Here Roddy is refined and anguished but also unsettling, in the tradition of vintage Peter Cushing, while Bereen just has a knack for putting viewers immediately on edge. Anna Margaret Hollyman also gives an unusually strong horror movie performance as the intuitive but insecure Thomas. Arguably, the cast is so good, they manage to not get completely up-staged by the creepy locations in and around Killadoon House in County Kildare. Cinematographer Wyatt Garfield really runs with the Gothic atmosphere, giving the film an eerie, perpetually overcast look. This is a smart, literate genre film that continues the mini-Irish horror renaissance represented by films like The Devil’s Doorway, The Lodgers, Cherry Tree, and The Canal. 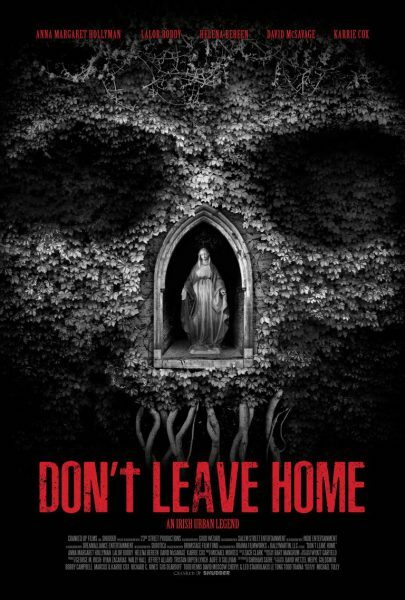 Recommended highly for neo-Gothic horror fans, Don’t Leave Home screens this Friday, Saturday, and Sunday (9/14-9/16) at the Brooklyn Alamo Drafthouse.